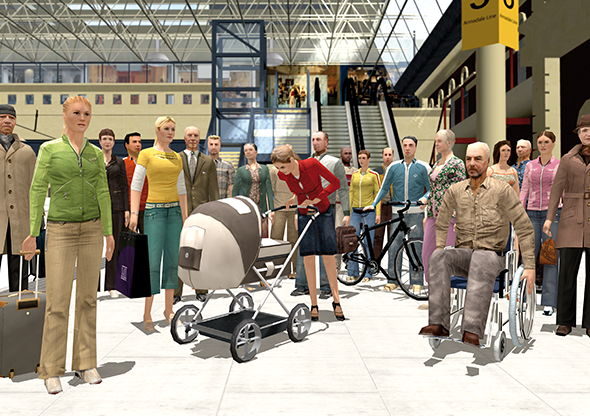 Passenger simulation reaches an unprecedented degree of realism and accuracy, introducing dozens of different people waiting on a platform, getting on and off trains, blocking a door, getting a bag accidentally stuck in it, and more. From 2014, train, metro and tram drivers who train on CORYS simulators can see passengers displayed with a new degree of realism. The latest version of the Corail workshop incorporates a revolutionary passenger simulation module* which goes much further than existing displays and behaviours. The module* includes a gallery of some one hundred very different characters – men and women of all ages (including children and teenagers) dressed appropriately for the season, some of them carrying a man bag, handbag, or briefcase, others pushing a buggy. Specific staff can also be added, in particular transport company employees. They are dressed in their uniform and perform the various actions and regulatory procedures directed at the driver in detail, complete with the various accessories (flags, lamps, whistles, etc.). Even when they are standing still on the platform, passengers have head, arm and body movements, and change which leg they are putting most weight on, which is typical for people waiting. An artificial intelligence module manages the adjustable density of passengers on the platform, and more especially their movements: speeds, trajectories, crowding around doors when the train arrives, flows of people getting in and out, and so on. These parameters can be adjusted for each of the stations on the line according to their layout and take into account the size of the platform, as well as its curvature, fittings, corridors and escalators. Any animated entity can be controlled, with realistic stimulation of its movements: a maintenance worker alongside the tracks at a depot, a passenger who has stepped off the platform or even a stray animal. During the simulation, passengers playing particular roles that disrupt normal operations can be added. These “actors” stand too close to the tracks, run alongside the train, obstruct the platform mirrors, block the doors after the door close alarm has sounded, accidentally get their buggy stuck in the doors, and so on. To create even more disruption, the instructor can even schedule evacuation of the train. This kind of training resource offers a number of benefits. First and foremost, it adds credibility and enhanced immersion quality. With this Passenger module*, CORYS has bridged the gap that has sometimes existed between even the most advanced simulators and high-end video games. The module also offers learning procedures applicable in incidental and exceptional situations. The Passenger module* is now offered with all new CORYS projects. It is the fruit of development conducted with RATP on its Paris metro simulator, in which even the passenger traffic in and out of stations can be seen. It uses the Matrix 3D image engine and can therefore be integrated into simulators already equipped with this. For other simulators, Matrix and the Passenger module* may be added during a complete renovation.